Why not have a sealed group for sonsivri users where we can connect in real time and share files? Please et me know (how and) when. How about security? Is it wise to expose IPs there? Telegram owner is very open for any request from a side, you see how it was quickly closed for whole country by iranian government request few weeks ago. of what users would like to use. the idea of this is nice but some will not have access to this. i personally am not in any need for this to share, since there are lots of sources on i-net. closed groups like here and other places. i am ok with an idea like this but sadly some will not have access to it. there are already lots of gooddies on sonsivri. Idea was great but telegram service was closed in some country. lol I see you need to post. so what about all the non posters, like in here, if they don't post it dies. I think its a bad idea. what is wrong with posting on Sonsivri, and having links to mediafire, or mega. 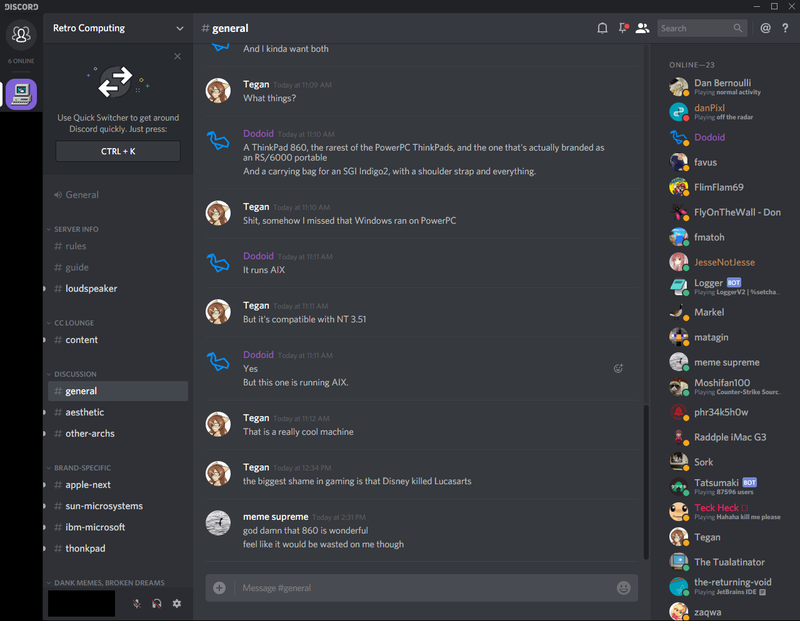 looks like discord is just another bulletin board. OK it may be more secure, but why do we need to be secure ? It's not a bulletin board, it's a full-fledged instant messaging service with very good management capabilities, also I'm not implying you should not post on this forum, I'm just saying having an instant messaging method alongside with this site would be great. Sonsivri works OK. Why change? IMO I do not think we need a forum for the Sonsivri forum users. That is a total lame idea. As we already working forum here. As Homer Homer Simpson would have said D'oh! The beauty of Sonsivri is that it DOES NOT have private/group messaging (OK, it does, but passing things behind the community's back is discouraged by the rules) and that it does have an archive of research topics available for the project you happen to be working on at the moment. And if you archive the messages logs of your encrypted chat into a section of this forum, your entire premise of being invisible disappears. There's probably an admin button that makes this forum invisible to all but members who sign in. It's a horrible way to grow and get new members, though, because then it becomes word of mouth only vs anyone with a search engine. Or...maybe that's not so bad, lol. Yes you hit the nail on the head. How are you going to post in secret when most can't post in the open. As a mod trying to get members here to post, and 50% of who get a warning, think it me being a bully. If they forget to post after a few mutes I put the RTC mute in action.